Human Horse Balance Ranch | A holistic ranch connecting the minds and hearts of horses and humans. Human Horse Balance Ranch is a holistic horse facility that has it all. Human Horse Balance Ranch is owned and operated by Peter and Paula Lambie, throughout the years they developed a way to connect and heal horses. 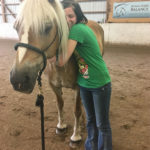 Providing training, daily (all year long lessons and all ages/levels), boarding (limited), clinics / workshops, Reiki sessions and classes for yourself as well as Reiki for horses. PLUS every summer we have our very popular 4 weeks Summer Horse Camp for Kids, which is always so much fun! Call Paula 603-716-6335 for more info/booking. 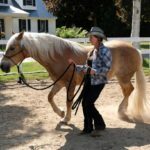 Human Horse Balance Ranch in Center Conway NH offers lessons for ALL AGES and all levels. Lessons are available year round in our beautiful big indoor arena, outdoor arena or round pen. Daily lessons (incl. weekends) all levels and ages from the basics of grooming, groundwork, Integrated Horsemanship to Integrated Riding with the emphasize on connecting to your horse (fun riding in balance and from your body language). Click the link for Pricing and registration information. Pete and Paula Lambie are both Reiki practitioners and committed their lives to be in service to help humans and horses. Reiki SESSIONS gives relaxation, better sleep, answers to your life's questions and enhances your bodies self-healing abilities. Paula is a Master Reiki Usui Practitioner and gives Reiki CLASSES as well (one day Reiki initiation class: Reiki I, II, III and Master) to teach you how to give Reiki to yourself, others and animals. Paula is a well accomplished practitioner since 2000 and has helped many people and horses over the years. HHB Healing Foundation is dedicated to provide equine therapy and coaching for the community. We have an emphasis towards at-risk youth groups and individuals, veterans, etc. In order to extend its mission to as many in need individuals and groups as possible, the organization will also provide training for mentors of the above mentioned groups. HHB Healing Foundation is a non-profit under IRS 501c.3 and as such contributions are fundamental to its success, donations are fully tax deductible and highly appreciated.